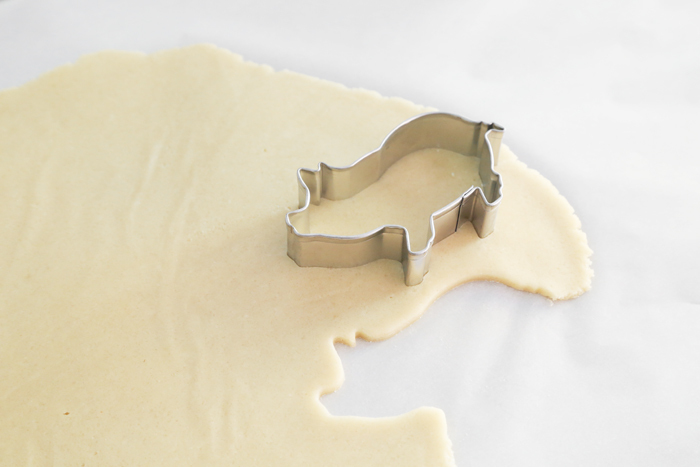 I purchased the cookie cutter here, but if you don't have time to order it (or just don't want to!) you can print the template I made here. Just print the PDF at 100%, cut out the shape and trace it onto heavy card stock (like scrap-booking paper). Then cut the pig shape out of the card stock. 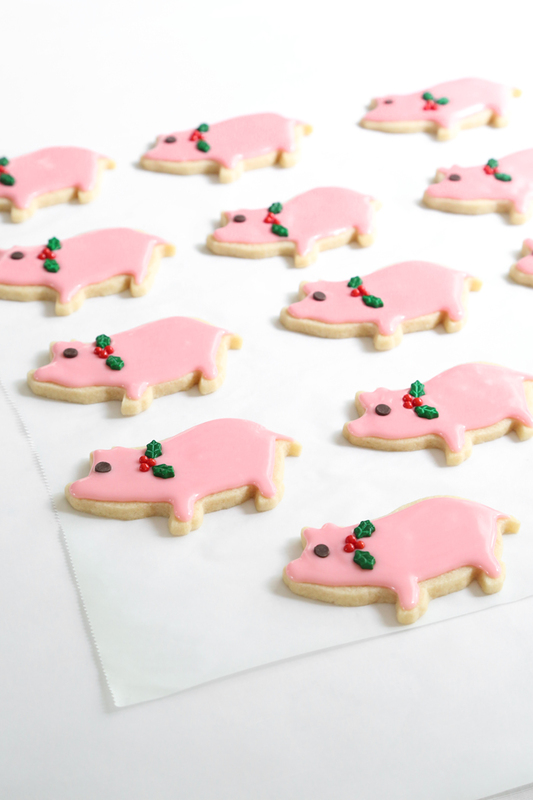 Lay the paper piggy onto your chilled, rolled cookie dough and use a small paring knife to cut around the shape. 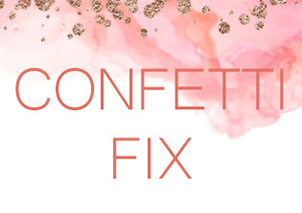 It's a little more work, but easy enough! 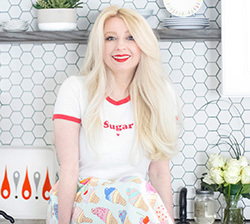 The icing recipe for this cookie is so easy to make and the decorating is hardly any work at all. The piggy's eye is a mini chocolate chip (point-side-down) and I used these holiday sprinkles to add holly berry motif at the collar. I decided to stick with the tradition of gifting the pigs in a little velvet pouches (I found a 10-pack here). You can fit about three cookies in the small 6-inch pouches, or you can buy larger pouches to fit more cookies. 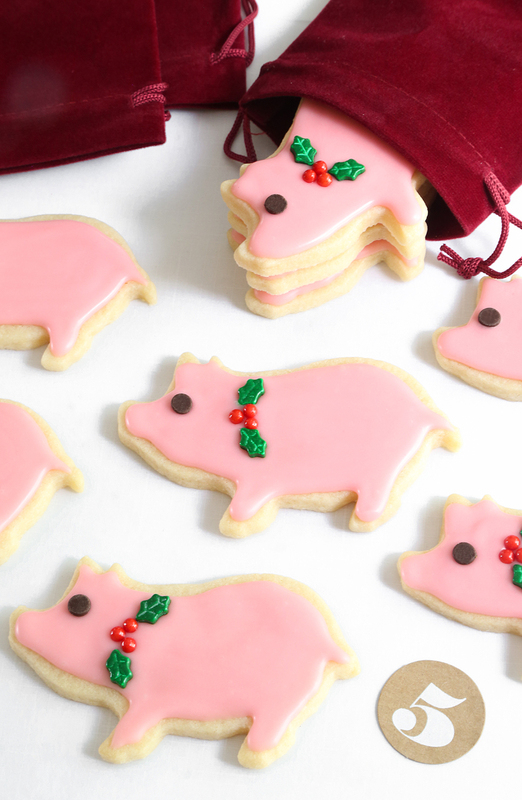 Even though these pigs aren't the hard candy version, you can still share them with the people you love for good luck in the coming year! Make the cookies: In an electric mixer fitted with the paddle attachment, mix the butter and sugar together until just incorporated. Do not over-mix at this stage, or the cookies may spread while baking. 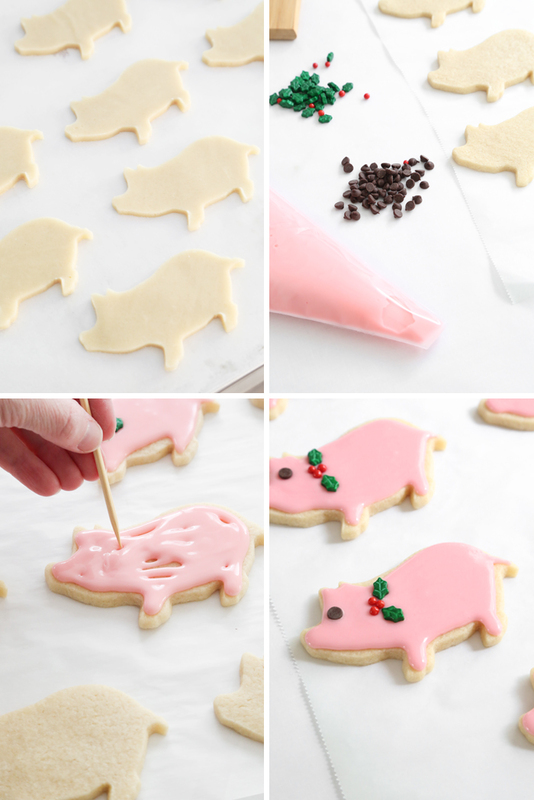 Use a 3.75-inch pig cookie cutter to stamp shapes from the dough, or use the printable PDF as a template (see blog post). Transfer the shapes to the prepared pans and bake for 10 to 12 minutes, or until the cookies are golden brown around the edges. Re-roll dough scraps and repeat process. Transfer cookies to a wire rack to cool completely after baking. 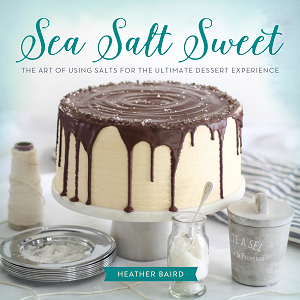 Make the glaze: Whisk the first four ingredients together and 1 tablespoon milk until smooth. The glaze should be very thick but soft enough to settle into a perfectly smooth surface on the cookie. If the glaze is too thick, add additional milk drops at a time until it becomes the correct consistency. 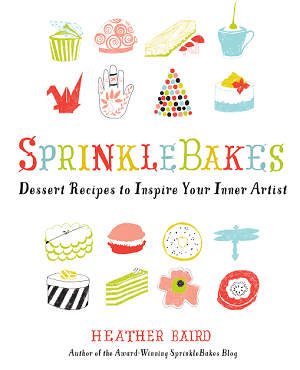 Transfer the glaze to a piping bag and pipe it on the cookies, or gently spoon the glaze neatly onto the cookies. Decorate! While the glaze is still wet, place a mini chocolate chip flat-side-up onto a pig face for the eye. Add holly berries and leaf sprinkles at the neck. Repeat with remaining cookies. Let stand until dry, about 2 hours. 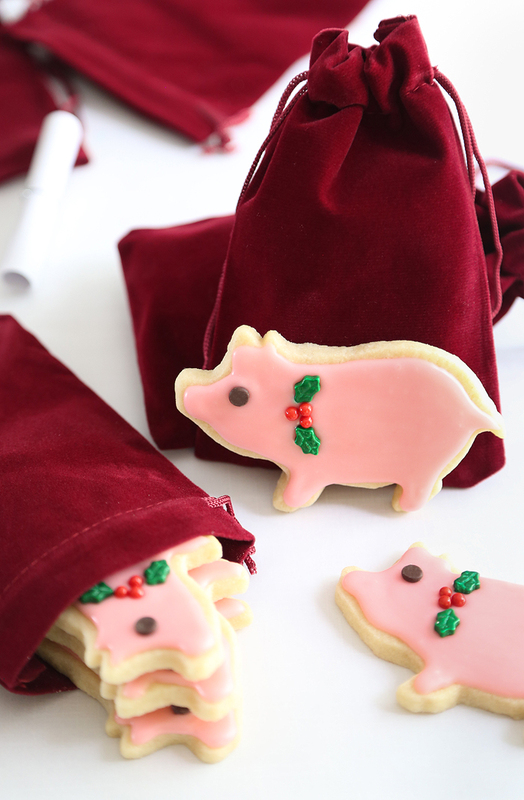 Gift peppermint pigs in velvet pouches. 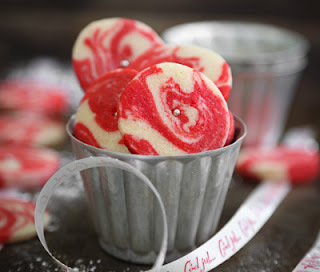 How adorable and yummy....love the pink color..I love the peppermint marble cookies too...I will be making these for sure. 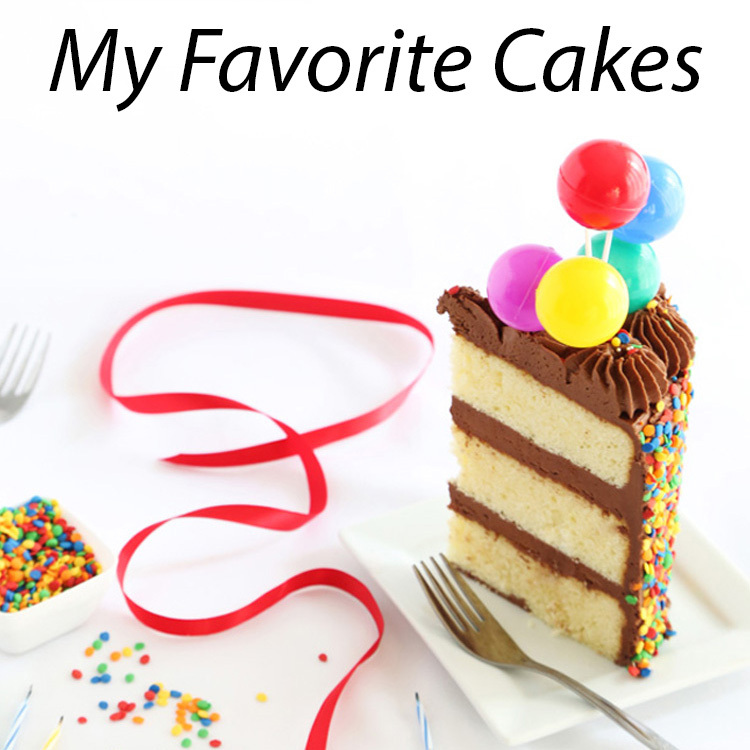 I was about to making this when I noticed there is no leavening. Is this correct? Yes, that is correct. There is no chemical leaven so the cookie surface is smooth and flat for decorating. Thanks for asking! So much cuter than the hard candy version, nicer to eat ... and none of the crazy smashing!